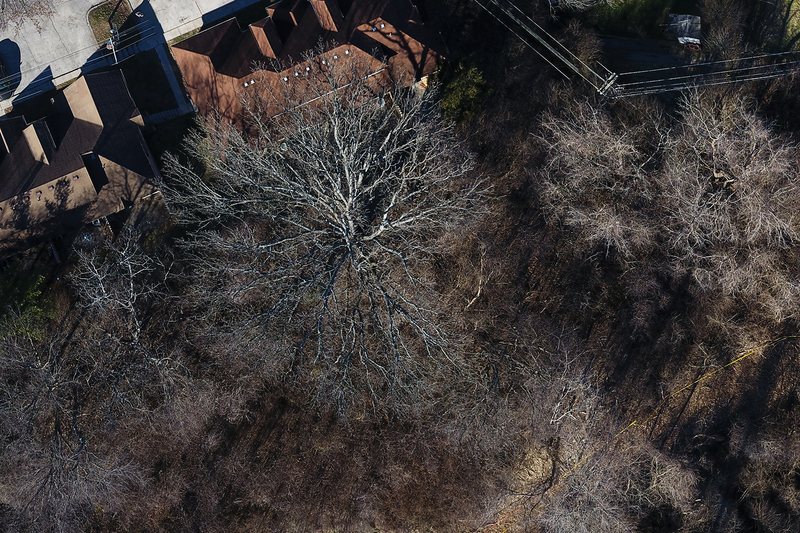 Today, the Venerable Trees staff worked with Beard House Media to get our first drone inspection of a huge bur oak. It is very difficult to estimate the volume of a big tree, or to inspect it for potential problems. Aerial or satellite photos often lack detail. Today, our friend Jeremiah Oschwald from Beard House Media flew his Phantom 4 Quadcopter over the big bur oak at the Peninsula on Squires Road. This cite has been approved for development, but we are protecting this magnificent bur oak and the surrounding trees. We plan to begin using drones to carefully inspect large trees and also to begin creating 3D models of trees. One of our goals is to be able to estimate the amount of carbon stored in the huge trees. Large trees are very important for carbon sequestration, one of the solutions to the problem of climate change. We will tell you more about this soon. For now, we hope you enjoy this wonderful aerial photo of this huge tree. Scroll down for more information about our drone use. Small drones have become much more useful as more automation is built into them. The Phantom 4 drone used by Beard House Media is capable of autonomous flight. Jeremiah programmed a grid into the drone's software. Once it took off, it flew directly to the grid, pausing at set locations along the grid to take a photo. The photo here is stitched together from multiple drone photos. This video clip shows the drone hovering over the big bur oak, then moving and pausing again. Posted in News and tagged bur oak, drone, Photography.